Car accidents happen every day. In fact, most people will experience at least one in their lifetime. Boca Raton car accident lawyers know that any kind of motor vehicle accident can be traumatic. For some people, however, the trauma of the accident lingers long after their physical injuries have healed. If you suffer from driving anxiety after a car accident, there are ways to overcome it. It’s normal to feel apprehensive about getting back behind the wheel after an auto accident. For some people, however, normal fears escalate into something much more. Studies reveal that about nine percent of people involved in a motor vehicle accident will develop post-traumatic stress disorder (PTSD), anxiety, or some other psychological problem. For these individuals, the anxiety surrounding driving or even riding in a car as a passenger can be crippling. When you struggle with PTSD after a car crash, it can affect nearly every part of your life. Not every car crash will result in PTSD or driving anxiety. However, researchers have identified factors that make it more likely for an accident victim to develop anxiety following an accident. Health experts point out that an accident doesn’t necessarily have to be catastrophic for someone to experience anxiety or PTSD afterwards. If a person believed his or her life was in danger during the accident, this belief can be enough to trigger PTSD. In many cases, people with driving anxiety don’t realize they have it. They may also feel embarrassed about the difficulties they experience when they are required to drive or ride as a passenger. If you are afraid to drive after an accident, your feelings may be much more than a little nervousness. Some people with post-accident anxiety also report being triggered by certain smells or sounds, such as the scent of gasoline or the sound of screeching brakes. For most people, it’s impractical to quit driving altogether. Moreover, putting aside your car keys does not really solve the problem of your anxiety and may actually make it worse. If you suffer from PTSD following an accident, there are several ways you can work toward beating your anxiety. Psychotherapy: Therapists who treat car accident-related anxiety use a variety of techniques to help their patients. Options include cognitive behavioral therapy, which involves talking about your experiences with a therapist, and exposure and response prevention therapy, which slowly exposes you to the source of your phobia – in this case, cars and the act of driving – in an effort to make driving more routine and less frightening. Driving Courses: Some people feel empowered behind the wheel after taking a driving course. Many communities offer defensive driving courses that teach motorists how to drive safely and avoid danger on the road. Medication: Your doctor can help you decide whether anti-anxiety medication is appropriate in your case. If you suffer from anxiety following a car accident, you may be entitled to compensation for your mental distress. Your symptoms are real. 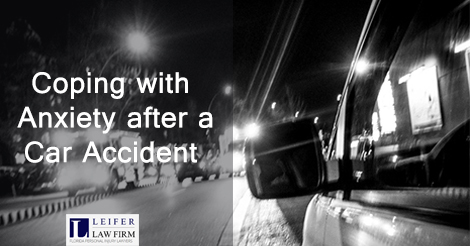 Let a Boca Raton car accident lawyer help you get the compensation you deserve.